On the most important day of her life, Shelby Hyatt woke up unable to breathe. The 16-year-old high school junior from Bryson City, North Carolina, swept her hands all around the nightstand trying to find her rescue inhaler, but in the pitch-blackness of an unfamiliar motel room her effort proved futile. As stated earlier, the nine dimensions of flow do not haphazardly or randomly present themselves. In almost all instances, the three antecedents must be in place in order for the process outcomes to follow. Some days, the universe seems to throw it all at you. Sweltering temperatures with no shade and no heat acclimatization because it’s mid-February? Check. A repetitive, uninspiring urban course through the middle of a concrete jungle? Ditto. The ability to enter into a flow state of mind will help any runner overcome the psychological barriers associated with a race. 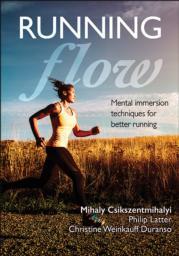 With Running Flow, pioneering flow researcher Mihaly Csikszentmihalyi gives you tools and strategies for experiencing the power of flow.